I'm a month and a half into this project (take one photo per day throughout all of 2013) and while I'm loving it more than I thought I would, I'm finding it sometimes difficult to stick to the literal rules of ONE photo per DAY. January, for example, brought some 14-hour days at work and a horrendous case of bronchitis/rhinitis/thePlague - so there were some days that I physically didn't have the time, energy or inspiration to take even one picture. I learned that I don't just want to take any stupid picture and call it a day. While I'm not going to end up with 365 Pulitzer-prize winning photos, I want to respect the creative aspect of this project and at least attempt to take a picture that's not just a blurry photo of my foot. So I allowed for some concessions: it's ok if I don't take and publish a photo per every 24-hours, just as long as I end up with one photo for every day by the end of the month. Sometimes I snap one pic and edit it a few days later, other times I take lots of pictures at one time and use the good ones to cover a few days (I went to the Met museum a few weeks ago and ended up with three great photos from that one day). And I think that's an ok way to do this project, because that's what works for me. I'm not going to get wrapped up in the rules and regulations of a project which I created. If, at the end of the year, I have 365 pretty great photos, I will call this a success. Get better at taking photos of people. I'm already ending up with waaayy too many pictures of clouds over my subway stop and the reflective buildings at Astor Place. I have a million friends, and I need to start including them in my process. Case in point - I went for bagels with some girlfriends the other day, and though I was in the perfect position to capture a really great photo (and memory), my pic for that day was of a colorful garage door. Buildings can be beautiful (and I'm surrounded by a lot of them), but I realize that pictures are interesting when something is happening. The two actions photos above (people dancing and my friend playing pool) are way more exciting than the well-lit piece of toast. No one wants to wait for you to take a photo so they can eat dinner. While I love food photography, this project is not the place for that. Good photos of food require time, lighting, composition and patience - not things you find in a crowded restaurant at 8pm in January. I had some lovely meals over the past few weeks, but I realized that not one person really wanted to wait for me to take a picture before we all started eating, and the picture that I did take was not at all good and not worth the hassle. 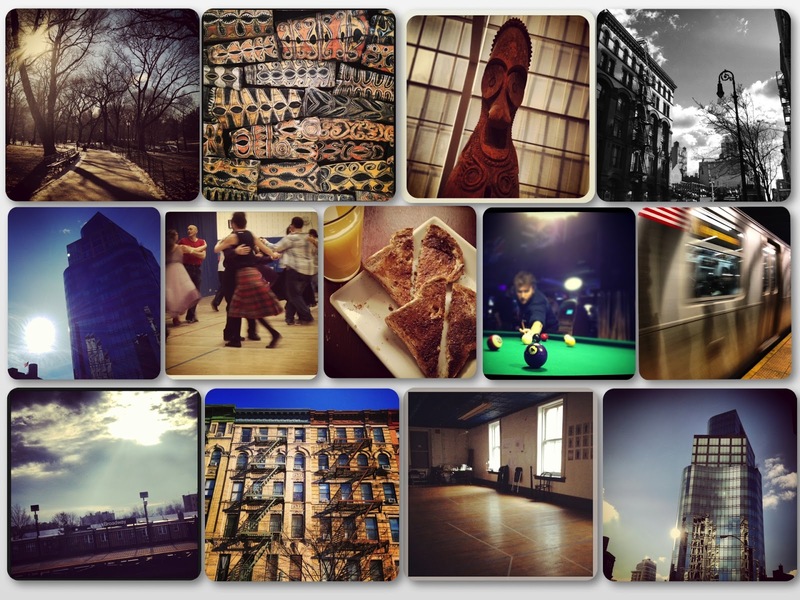 As always, follow me @maspad on Instagram if you want to see the (mostly) daily photos! Didn't you take a really pretty photo of your food at Bouchon Bakery or maybe all I saw was the pretty food. Not to be fact checking your Photo-a-Day blog post or anything.